The weekend has gone, and on this sunny Tuesday, Vintage Industrial Style ‘s Blog will give you, your favorite caption of the week! On this week’s Best Deals, your favorite vintage blog has searched and selected the mid century lamps everyone is looking for … and at the best price! See which are DelightFULL’s best sellers that are with a special discount on the lighting market! READ ALSO: Bright Up Your Industrial and Vintage House With Barry! Brubeck Lighting Family is one of the most well known families of the Portuguese Lighting Brand – DeligthFULL. A brand inspired by the mid-century era and the jazz industry inspiration. Brubeck pendant lamp is an exquisite mid-century lighting design, with a subtle touch that will add a special glow to your home décor. Ideal to place on your living room décor, just right above a vintage armchair! Brubeck family has another member that never passes unnoticed! Brubeck wall lamp is one of the number one choices when it comes to contract lighting pieces! This sophisticated and elegante piece is very versatile, and you can place it in any style décor or room of your house. Handmade in brass by talented portuguese artisans that still use ancient techniques to produce these master pieces, you can customize the piece and turn it yours! Choose another finish or color, size, and even the type of bulb. 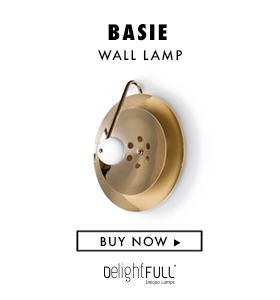 If you’re willing to go for the gold plated version, we have great news, because it is at its best price on DeligthFULL’s floor samples section. Coltrane is one of the best sellers, and we can understand why! Inspired by the one and only, John Coltrane, Coltrane suspension lamp is the ideal minimalistic lamp you’re looking for! Insider tip: purchase more than 1 coltrane lamp and display them with different heights! You’ll create an incredible lighting effect! Handmade in aluminum, you can choose another color and size! The matte black and gold powder paint version is at its best price ever, please click on the button to discover more! Coltrane wall lamp is a different lighting category, however with the same design as the previous one. Perfect to pair up with a vintage industrial style furniture décor. And what is better than one coltrane wall lamp? Several! Coltrane standard version has 1 pipe, however you can add as you wish! The single coltrane in matte black and gold powder paint has a special offer, check on DelightFULL’s floor samples section! Last, but not least, this list wouldn’t be completed without the amazing ike pendant! This pendant lighting design piece was inspired by Ike Qebec, Tina Turner’s ex husband, and it is what Scandinavian style is all about! Ike Pendant is handmade in brass and aluminum. The glossy black and gold plated version has the best deal since we remember! READ ALSO: PART II: Let Our Moodboards Be The Inspiration For Your Vintage Home! Bright Up Your Industrial and Vintage House With Barry! DelightFULL On Tour: What You Can Visit In Milan While iSaloni 2019! Best Deals: Rock Your Home Décor With Matte Black Lamps!